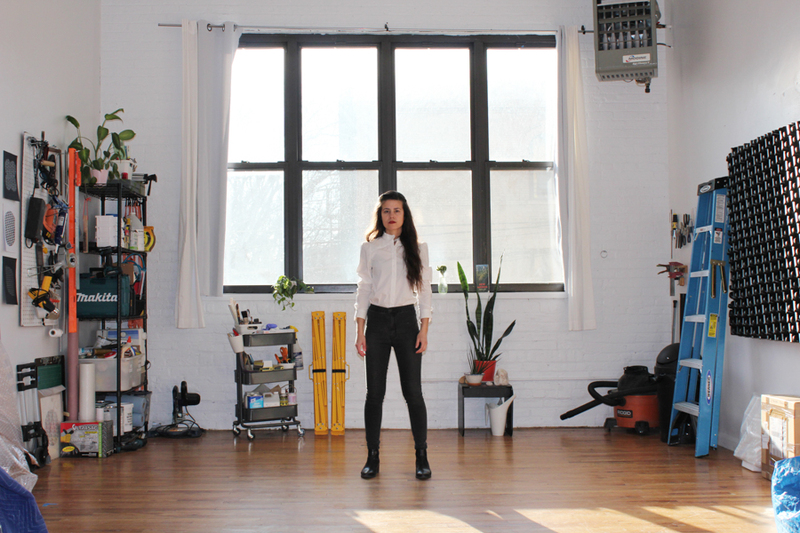 Amanda Martinez (above) in her Bushwick studio. Photo courtesy of the artist. Amanda Martinez is an innovative sculptor forging the aesthetics of contemporary art one piece at a time. Maake Mag sits down with Martinez in her sun-filled Bushwick studio as she puts the finishing touches on her newest piece, Testament, which will be on display during the 2019 Spring/Break Art Show. As Martinez gears up for two upcoming solo exhibitions both in California and abroad; we reflect upon her personal journey which finds its roots in Greenville, South Carolina. Surrounded her extensive assortment of hand tools, we uncover the process which makes Martinez’s work monumentally sublime and discuss the transformative ethos behind the work. Maintaining a studio practice manifests in different ways depending on the artist. Can you tell me about your creative start and what has influenced your concept of "practice"? Learning to play the piano was my first creative pursuit and it really laid the foundation for the way I approach everything. Needing to practice hours a day in order to gain skill and technique instilled in me self-discipline at a young age. My younger sister was also a ballet dancer with a company. She was always practicing, stretching, and rehearsing when we were growing up. Club Anthem, 2018. Hand-carved polystyrene, acrylic enamel, acrylic polymer, sand, shredded tire rubber, 4' x 4' x 5". Photo courtesy of the artist. I knew that you had to invest time in yourself, in your body, or your tools to develop your craft. I saw very little separation between artistic disciplines because I was enveloped by many different forms of making. I think people say the phrase "studio practice" sometimes but forget what the word "practice" means; which to me is the act of rededicating yourself to art daily. Does music continue to influence your work? Music is my first love and I place importance on listening to a huge cross section of everything from jazz to electro to cumbia to ancient choral music. I'll never forget when I was in music theory class as a fourteen year old and learned about the "Hollywood effect" on Western music. It explained how culturally we are taught to perceive dissonance as "bad" or "chaotic". Through conditioning we prefer our music to have chord cadences that provide us with a feeling of resolution while many Eastern musical traditions take the opposite approach and embrace dissonance and noise. These musical concepts made me reconsider what we as Westerners are programmed to think and what we choose to close ourselves off from because they're too "open". It left a big impression on me as an isolated teenager growing up in the evangelical South. What prompted you to go from making music to making sculptures? Interestingly, I grew up in a very conservative, highly religious environment but went to a special art school for half of the day which offered everything from metal smithing to performing arts. I feel lucky to have been surrounded by art of all kinds during high school. I had very little interest and guidance in education outside of that, so this program literally saved me. One of my first drawing and painting teachers was a scenic painter and sculptor who worked for the theater department and even made sets for the ballet company my sister danced for. It was fun watch that process and develop my own toolkit of skills. I learned how all the disciplines could exist in concert together. That experience still resonates with me and maybe it’s a sculptor thing but I'd say we're all a bit into "world building". Which artists have left a major impact on you, your work? As far as artists I love: Myron Stout for the quietness and elegance of his forms Sol LeWitt for the performative elements in his work, Agnes Martin for her economy but also being unabashedly emotional, Rosemarie Trockel for always changing, Petah Coyne for being over the top and challenging the decorative, Barbara Hepworth for her uniquely personal language that I think has been borrowed every which way and for also being a woman who managed to get a lot done in spite of all the traditional expectations placed on her in her time; and of course, Eva Hesse for her spirit and willingness to take on new materials but also because her "mature" work was decidedly minimal but unafraid of showing the hand at work. I am also constantly inspired by my friends, their minds and their resilience as we all navigate what it means to be an artist in New York now. Walk me through the process of making one of your sculptures; from genesis to execution. Sometimes an idea for the overall form or silhouette of a sculptures comes first. The interiors of each piece are made from layers of insulation material which I hand carve into shapes or “profiles”. At times these "profiles" shapes are the starting point. There are times when both of these elements come together simultaneously, but then I have to go back and edit down. I’ll take off a corner or change the overall form in some way. It really depends on the piece. I try to work out those details in what woodworkers call a "dry fitting", right before things become permanently adhered, but sometimes you just can't tell. I'm always looking for forms to become activated, or the surface to feel dynamic. Something might seem good on paper but I'll never really know how I feel about a piece until I start building it and can assess from there. Appollonia, 2018. Hand-carved polystyrene, acrylic, acrylic polymer, shredded tire rubber, sand, wood, 54" x 5'4" x 16". Photo courtesy of the artist. Coating with color comes last. It unifies the finished carving. I refer to the last step as "coating" my work because for me it's not really about the process of painting, but more about what the color and texture does for the carving. I get a feeling about whether a color is working for a form or not. I used to rely upon bright synthetic colors that they felt as man-made as the plastic material I work with. However, I try to keep things straightforward and monochromatic these days. I enjoy countering the material with classical or subdued colors like black, white, grey, and brown. For me these colors add another moment of suspension of disbelief like... "what is this made of? Is it wood or stone or something else?" Occasionally I will work with textures and additives like flocking or experimental pigments, but consciously try to avoid slipping into the decorative arts realm. From a distance your work appears slick, flawless, and seemingly manufactured. Upon closer inspection nuances and inconsistencies emerge which reveal the time and labor intensive process you employ. What interests you about imbuing this dichotomy into your work? I'm interested in nuances, the subtleties that can happen inside of a piece. It's important to me that the work is handmade and that the viewer can see my hand in each part of it. I'm not interested in being a designer or having my pieces pumped out at a fabricator. I'm even a little anti-technology. I need to touch, handle and manipulate all aspects of a piece, this process is in and of itself is performative. The viewer sees me striving towards relative "perfection" yet always falling short. To this end I think of the surface pattern as having a path that is "self-determined" not "pre-determined". As abstraction, I think that you can read them a few different ways... there is the short-term interaction where you just kind of view the surface and what it does formally. Even though it's not directly in the content of the work, there is a lot of human stuff in there... there is always the presence of the body and the hand in my sculptures and I try to imbue a lot of emotion in each piece as well. I'm interested in creating densely carved surfaces where in a viewer can experience moments of "zoning out". In general the term "zone out" tends to have a negative connotation, like someone is disengaging; but for me it's more akin to taking a psychedelic drug or meditating, or doing whatever activity one does to just turn off outside noise and access a different part of your brain. Considering the rise in technological noise I see this as something more people want to do especially; we need some type of an escape. With this being said, I would never want my work to function as some kind of remedy, rather it's important for me to create psychological space where one can think about "big questions" away from the daily distractions. Ultimately my hope is that the longer someone spends with a piece, the more they might engage with the differences and relationships which take form in all its details. Chant II, 2017. Hand-carved polystyrene, enamel, acrylic polymer, shredded tire rubber, wood, 3'2" x 3' x 18", 2017. Once you start a piece it’s important to see it through to completion. How do you address unexpected obstacles that arise during production? I won’t truly know if something will work or not until I build it. I tend to be someone who takes an "all or nothing" approach with a lot of things. In regards to the work I think of it as not being afraid of commitment. To make a sculpture means that I dive into a relationship with the initial idea and power through. This commitment allows me to tackle the "big picture" while self-monitoring so I don't get lost in details of the labor intense process. If something is not working I take a step back to assess where these feelings are coming from and find a way to move forward. I like to imagine classical sculpture studios what would happen when something weird came up while carving a life-size figure in marble. They would have to create a solution which could turn that mistake into a disguise. I don't ever want my work to feel so precious that I can't destroy it if I want to. I appreciate the resourcefulness that comes with building something and the idiosyncratic ingenuity which is inherent to working large-scale. Testament, 2019. Hand-carved polystyrene, enamel, acrylic polymer, 5'5" x 17" x 17". Photo courtesy of the artist. How do you perceive your work breaking away or incorporating elements from sculpture's androcentric history? This is something I love about creating large sculptures as much of it is performative; a kind of "posturing" that until recent history was perceived as predominantly male. I choose to mainly use hand tools because I feel a strong desire to connect with the traditional conversation of sculpture: carving has been done for millennia. I enjoy "taking up space" which can be seen as a masculine role. I challenge the notion of “machismo” with the materials I use. For example polystyrene is a relatively new product and therefore has a less precious presence. At times I’ll use wood for supporting elements as well. In my mind this combination of materials are very American and reference construction and prop-making. There's something magical about transforming these everyday materials to appear as something else, like trying on a skin of this more ancient sculptural history. There are times where I can love and appreciate a sculptural "master work" for its technical prowess but find that is fails due to its intense lack of vulnerability. For these artist perhaps it was more important that their work was universal rather than personal; a stand-in for some larger political agenda. I try to be unafraid of utilizing personal and emotional experiences as content in order to counter that macho history. I think it's good to feel conflicted about a piece. You mentioned pairing down or synthesizing your color into monochromatics. Are there any other shifts happening in the work at the moment? I'm mostly concentrating on making my language more succinct. Well, succinct, but open... it's an on-going challenge but I think it leads to interesting decision making. I'm not sure I know where the work is going. I just have things I want to get across and then you have deadlines to abide by. It might be cliche to say, but I mostly want to let the work itself lead me; so I don't know that there will be a "final" outcome, other than what my work looks like at that particular point in time. I think it would be a disservice if I did know what that looked like. I want my work to always keep growing and changing—I think that's the most important thing. To find out more about Amanda and her work, check out her website.